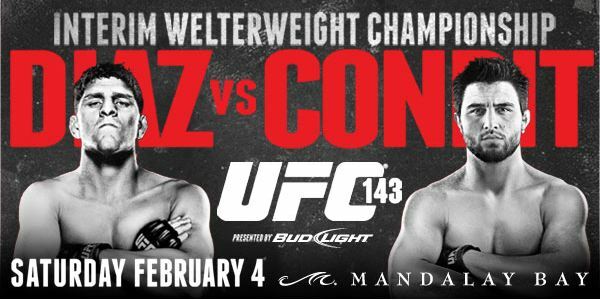 UFC 143: Diaz vs Condit was a huge success for Kamiakaze Overdrive MMA Predictions; finishing with a prediction record of 7-1-0, including the main event upset of Carlos Condit over Nick Diaz. Adding to the success our UFC 143 Betting Package paid out on 3 of 4 parlays for a huge night cashing in at $804.10, check out the betting package results posted below. This successful night pushes our 2 event Betting Package payout total to a fantastic $1024.10 and it only cost our followers a combined investment of $10 over two events. The Kamikaze Betting Package for UFC on Fuel TV Ellenberger vs Sanchez will be posted closer to the event, don’t miss out! Update: UFC 143 Bonus Prediction was the underdog New York Giants to win the Super Bowl, suggested taking NYG on the moneyline and at an alternate spread of -3.0, both won, missed on the Over of +55.0. Nice way to finish an excellent Predicting/ Betting weekend for Kamikaze Overdrive. -With still two fights to go this is still a very close matchup, make sure you check back for both competitors UFC on Fuel TV predictions closer to the event. -Carlos Condit stuck to a game plan and didn’t get pulled into Diaz’s style of fight and as a result left with the belt. -Ed Herman’s submission win and Fabrico Werdum’s dominant decision victory played out almost exacty how the fights were predicted. – Mike Pierce pushed Josh Koscheck to the brink, and most likely that fight was won on the basis of what additional takedown, the headbutt that busted Pierce open which made Kos look like he had hurt his opponent, and Kos’s already established name. Check out the Fightmetric.com statistical breakdown (Koscheck vs Pierce) for more proof as Pierce landed more overall strikes and significant strikes during the fight. -Overall it was both an entertaining night of fights and a sucessful one, congratulations to all of those who invested in this events betting packages, cashing in huge and we will see you back here for UFC on Fuel 1: Ellenberger vs Sanchez.